"Media and Public Diplomacy in the Digital Era"
Reception to follow. Light hors d'oeuvres will be served. 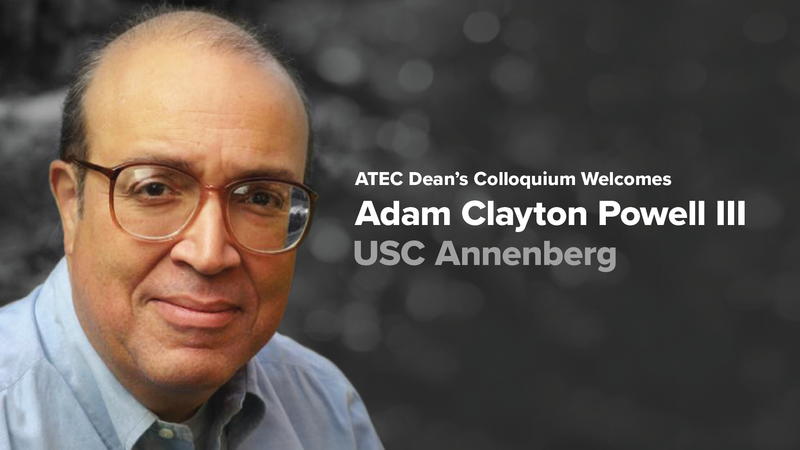 Adam Clayton Powell III is an American journalist, media executive, and scholar who currently serves as Director of Washington Policy Initiatives for the University of Southern California (USC). Powell leads the USC Center on Communication Leadership and Policy (CCLP) initiative on mobile phones as a platform for public service. He also coordinates CCLP’s Washington DC programming, which includes monthly public forums on subjects ranging from public service and online media to the future of journalism. Before his move to Washington in 2010, he served as USC’s Vice Provost for Globalization, working closely with faculty and deans to advance the University’s globalization initiative, expanding USC’s international presence and promoting the university throughout the world. Powell is also a senior fellow at the USC Center on Public Diplomacy, both of which are housed in the Annenberg School for Communication and Journalism. Powell previously served as Director of the USC Integrated Media Systems Center, the National Science Foundation’s Research Center for multimedia research. He has worked extensively in Africa, Asia, Europe, Latin America, and the U.S. on training programs in digital media for journalists, educators and policymakers. Previous roles include Vice President of the Freedom Forum; General Manager of WHUT-TV, the nation’s first African-American-owned public television station; Executive Producer at Quincy Jones Entertainment; and Vice President for news and information programming at National Public Radio. Powell is widely published, and many of his writings draw on his significant international experience. He recently contributed a chapter to America's Dialogue with the World and published a book entitled Reinventing Local News: Connecting with Communities Using New Technologies. He has also written for a number of publications, including The New York Times, Wired Magazine, and the Online Journalism Review.